Discomfort, aches & pains: Being unable to enjoy life to the fullest can be a real pain - literally. Tennis elbow, shoulder pain, back pain affects the performance of body and mind, and drains your physical and mental capacity. Chronic pain often becomes unbearable and at Back II Life we often see those patients who have been through the mill of various therapies and practitioners. Chronic pain is often caused by amongst others persistent inflammation, stiffening, calcification or strain on muscles, fascia or tendons. Although research has shown that chiropractic adjustments are very effective for some cases, these may required in combination with advanced technologies to overcome the problem. Before treatment begins, it is important to identify the type on problem and its likely cause so that treatment will be effective and lasting. At Back II Life, we take the time to understand your concerns and examine you carefully to better understand your problem and guide your body through the healing process. The tailored solution may consist of any combination of manual treatment with or without advanced technology as well as prescribed self help exercises. Whether the problem has began recently or is a long term concern, we design an appropriate strategy to best overcome your specific condition. There are a variety of problems that require a variety of interventions to get sustained relief and at Back II Life we combine hands on treatment with technology to ensure a smooth recovery. Now there is are outpatient therapies that fight the causes of both acute and chronic pain - without the need for injections, medications or surgery. 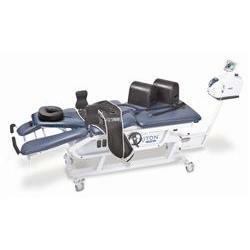 Advanced DTS Non-Surgical Spinal Decompression for pain relief related to the neck and back. These spinal problems may appear as pain or numbness in the arms and legs even without spinal pain or discomfort! At Back II Life, we only use the highest quality products that are FDA approved and, have good research and evidence. By combining clinical excellence and applying advanced technology, we aim to ensure lasting relief. The Swiss DolorClast® method treatment, both Extracorporeal Shock Wave Therapy (ESWT) and Radial Shockwave Therapy (RSWT) is effective for a range musculoskeletal problems like chronic muscle aches to non-surgical alternative for tendonopathies. A non-invasive alternative to surgery, steroidal injections and oral medication. Don't let your life be ruled by pain. Call our office at 62351220 for an appointment today!